This time of year, there are presents to fit in boxes, wrapping paper to measure and cut, and finally the feat of deconstructing the Christmas tree. My ornaments are mostly glass, so they get carefully wrapped in tissue paper and placed in small boxes. Then I place all of these tiny boxes with their crushable contents into large cardboard boxes for another eleven months of storage. These boxes are wrangled into the cramped and oddly shaped space underneath the stairs. It is an exercise similar to piecing together several interlocking 3D puzzles with the bonus of being a high stakes game. High stakes, that is, if you view the ornaments as mementos, each a memory of some bygone Christmas. As a result, I have been thinking about the shape of things. My partner, Scott, is a photographer. When he sees the world, he frames it and considers composition. He sees light and shapes differently than the non-photographer. It is a compulsion. The writer’s compulsion is to shape narrative. We build scenes, crafting narrative into manageable units, each one serving a larger purpose. In this way, stories take a shape. The shape, however, is conceptual instead of visual or tactile. Word choice and rhythm dictate an aural structure to prose. I strive for smooth transitions as I link paragraphs and favor white space between section breaks, but as a prose writer, spatial relations are not really a consideration. Once the margins are set, the computer provides a virtual never-ending scroll to be filled with text, and design is not a consideration. Sometimes changing the way we work with our work, viewing it as something other than text, enhances our work as writers. 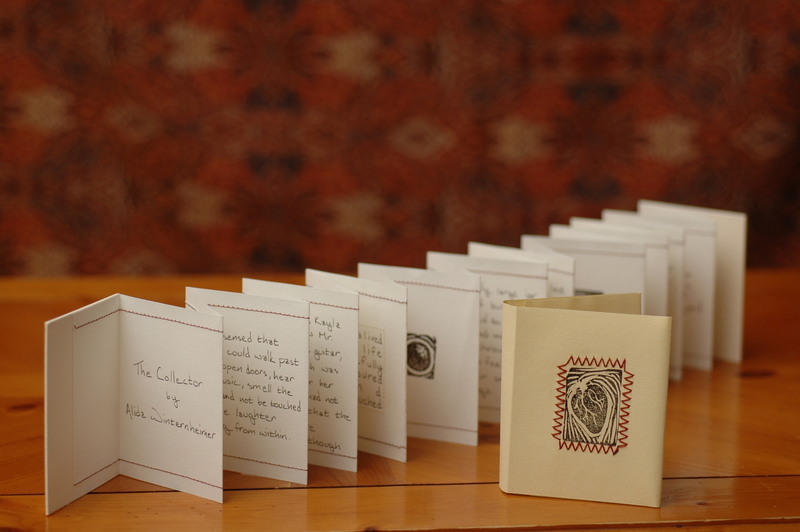 I took the Bookmaking for Writers class at Hamline University in 2010. One of the course objectives was to explore how form influences content. Because we were creating small handmade books, we studied the haiku and flash fiction. Our writing began with a consideration of its package. But the process did not stop at writing small prose for a small package. The process involved creating a unique package that would best present the story. Committing my words to the page meant finding a harmony between word, image, and form. I developed an aesthetic that went beyond the aural to encompass the visual and the tactile. For example, in my hand-written book, I used a mock up to work out how many words would fit on each page and how page breaks would affect the narrative. I also had to decide whether to write the book in cursive or print. I invented a handwriting different from my own for three words critical to the story (see image). The book has pages that can be turned or spread out like an accordion. I used block prints and incorporated thread into the paper. The words themselves became art as I sorted out complex relationships between each element. Ultimately, I packaged my story into an experience, and every choice was an aesthetic one. By adding illustrations to my text, I found there were things I did not need to put into words. I placed my pictures in such a way as to become part of the narrative. When the pictures were not included for a different version, I had to fill the holes with words. If I’m stuck on revising/editing a manuscript, sometimes it helps me to view it in the “read” mode, as if I’m actually reading it in the format that resembles a book. 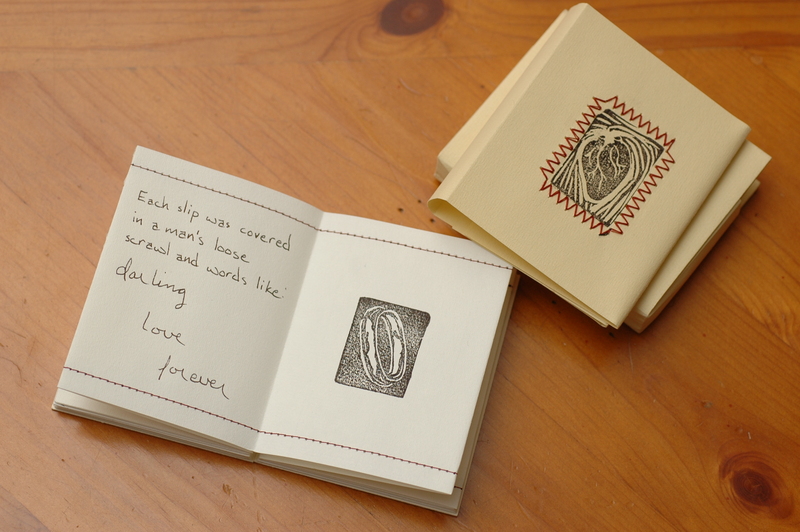 Or, better yet, print it out, back to back in a book format–cut and stapled to resemble a book. My respect for the story increases, yet at the same time my expectations are greater and approach those I’d apply to an already published work. “Technology can do this as well…” Might you be thinking Underwood typewriter and paper vs. laptop computer and Word? Interesting idea to put the ms in the format of an actual book. I will have to try that. Thanks. I made the block prints myself, carved out of this foam rubber material specifically for block printing. It was great to do something tactile for a change.